One of the huge perks of staying in the cite, is the museum pass that allows access to many of the top museums, one of them being the Pompidou. Their current theme is “elle” (she), a feminist look at art. All the artists thus are women, and it is really cool to see how many good contemporary art is made by women. NANCY SPERO,(USA)(1924 – 2009) is the leading artist with an overview of her life’s work. I happened to do an assignment on the work of her husband, Leon Golub while at UNISA. The two were very involved in left-wing anti war etc. movements in the USA during the 70’s and 80’s. He made a series of paintings depicting CIA members illegally interrogating and torturing South American subversives. All the material was gathered from photos in Army-type magazines published in the USA. Scary stuff!. Nancy also uses this type of imagery to chronicle wars and apocalyptic violence against women. She gathered images from prehistory to today, and screen-printed them on pre-painted backgrounds, freely using words, quotes and her own thoughts on the canvasses. And look, she has the same hairdo as me. In a separate exhibition space is the winner of the Prix Marcel Duchamp, SAADANE AFIF. Not exactly “art making”, but hey it is the Duchamp prize. His work also reminded me of a statement written by Elfriede Dreyer of the FRIED gallery for a previous exhibition where Michaella and Gordon Froud worked together on a piece. The statement was about contemporary modernism, and the idea that artists have been collaborating on projects more often, rather that working as individuals. In the case of Saadane, he asked his friends who “aren’t so much songwriters as people who enjoy writing”, to write poems or lyrics, that he placed against the walls. 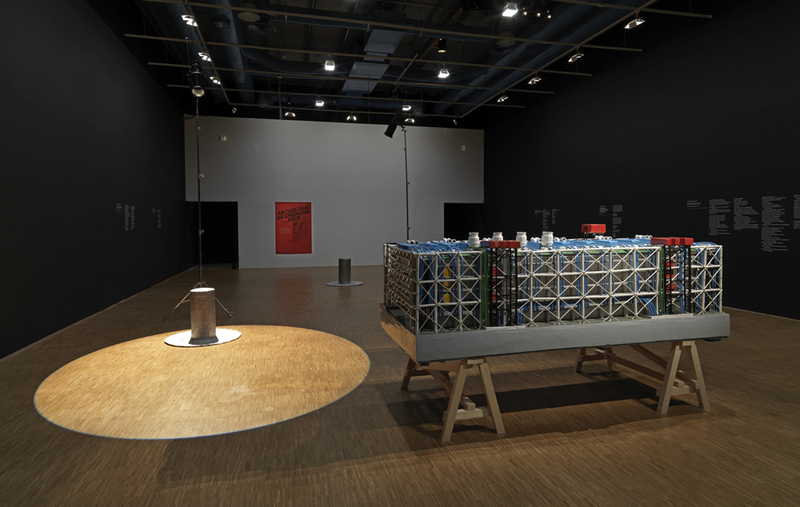 In the middle of the space is a model of the Pompidou that he commissioned from the coffin makers in Ghana. This, he insists is a sort of Vanitas to art – “the death of beauty, the death of painting, and then the death of the artist” wow, if you read the blurb before looking at the exhibition, you would have enjoyed it.